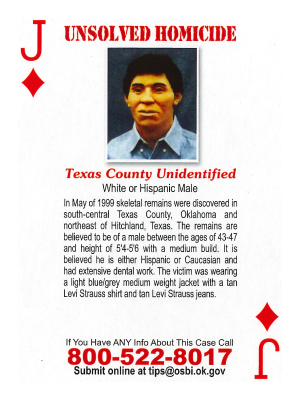 In May of 1999, skeletal remains were discovered in south-central Texas County, Oklahoma and northeast of Hitchland, Texas. The remains are believed to be of a male between the ages of 43-47 and height of 5'4-5'6 with a medium build. It is believed he is wither Hispanic or Caucasian and had extensive dental work. The victim was wearing a light blue/grey medium weight jacket with a tank Levi Strauss shirt and tan Levi Strauss jeans.